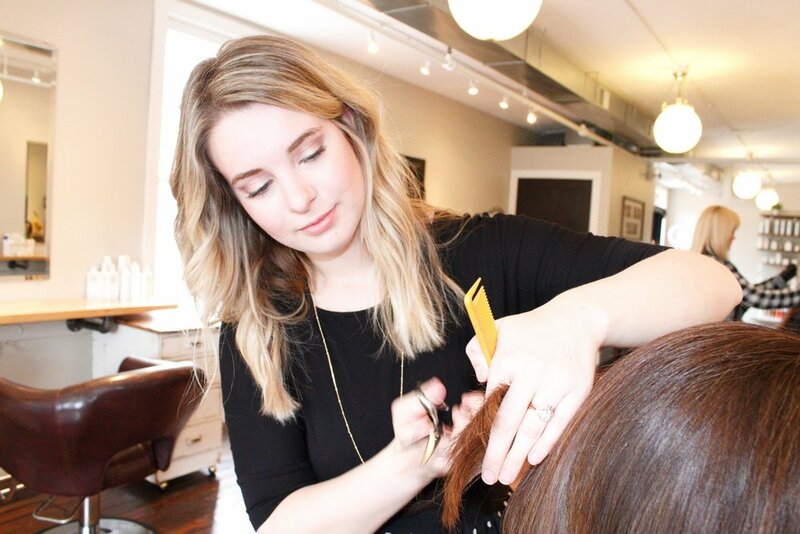 Stylist Spotlight: Jenna Lundell — THE HAIR TAILOR. I’ve been in the industry for nearly four years. I attended the Aveda Institute in Minneapolis. After graduating in 2015, I went on to complete a year-long apprenticeship in Woodbury. It was amazing! I’m so glad I took the time to do advanced training — I really learned how to customize each color and cut for every client! What is your hair specialty/favorite thing to do? I am a blonde specialist all the way! I’ve been blonde for nearly my entire life, so I have the most personal experience with it. I love teaching clients how to care for their blonde and keep their hair healthy. I get excited about any kind of dimension color, but I also have a love for short textured haircuts, razor cutting on any length, and special event styling! What is your go-to product that you can’t live without? I’m really loving the Keratherapy Smoothing Crème because it’s simultaneously repairing and moisturizing. Plus, it smells amazing. It works great on any hair type and really enhances the shine to the hair when I feel like my color becomes dull and flat. I’ve been using it on all my clients as well! What is your go-to Starbucks order? Iced Chai Tea is my fave. Too much caffeine will makes me crazy… you do not want me foiling your hair after a shot of espresso! I honestly can't decide between Jennifer Lawrence, Emma Roberts, Julianne Hough, and Lauren Conrad. They all have amazing taste, amazing hair, and are color chameleons! I baby my hair SO much, so I don’t really do anything too crazy. When I was in beauty school, I colored a piece forest green and it looked so cool for one day. Then it faded to this awful green snot yellow color and would not go away. NEVER AGAIN. I will probably be a blonde for life! How long does it take you to get ready every morning? I can get ready in a solid five minutes if I need to, but on a normal day it only takes me between 20-30 minutes if I’m going to work. I've got it down to a science! What is a hair trend you wish would make a comeback? CURTAIN BANGS. I love these and am obsessed with them. They are SO much fun and are flattering on the right face shape, work on any length of hair, and are long enough to stay off to the side while short enough to soften your features. They’re perfect and so easy to grow out if they drive you insane. After a few weeks, they'd just tuck perfectly behind your ears, no harm done! They are the lowest commitment way to completely change your hairstyle. What are you bingeing on Netflix? I just finished the Handmaid’s Tale on Hulu, which was insane and so interesting. My all-time fave go-to is Parks and Rec. I’m also watching Shameless right now, which I am loving! What do you like to do outside of the salon? I am a total homebody. I love gardening, have tons of houseplants, love an occasional home renovation project, and am getting into cooking a little bit more recently (AKA I’m a little old lady on the inside). My husband, Eric, and I got married last September. We love to go hiking, watch movies, eat in downtown Hudson (especially at Mallory's and Postmark Grille), along with spending time with our families!